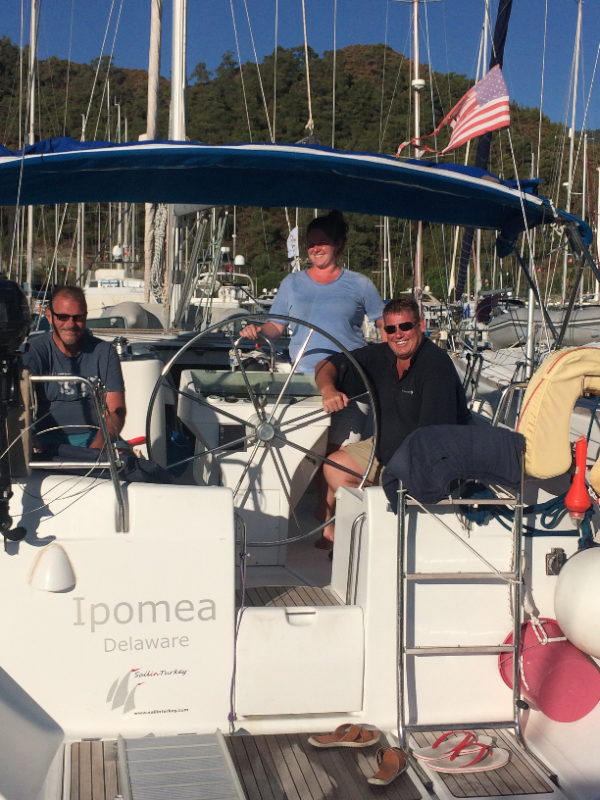 Wow, what a fabulous time we had sailing on Ipomea. It was our first time in Turkey. All we can say is that it’s beautiful, The people are lovely, the food is great & the sailing is wonderful. This was our second charter and Ipomea was kind to us, easy to sail and nice and comfortable. The weather was calm most of the time which meant we had to motor sail a lot of the time. We loved finding an isolated bay a few miles from Datca. Bozburun was quaint with loads of good restaurants & bars. We found that Datca had the best choice of restaurants and shops. We would like to thank Mark & Stef for answering my many questions very promptly and also driving for an hour or so to fix the warm fridge problem. Oh forgot to say a big thanks to David Jakeman our ICC Instructor – he taught us in a way which makes things easy to remember and made the complicated things uncomplicated!